State Bank of INDIA is a first Indian Bank who have started Online Registrations to enroll for Pradhan Mantri Suraksha Bima Yojana (PMSBY) and Pradhan Mantri Jeevan Jyoti Bima Yojana (PMJJBY). 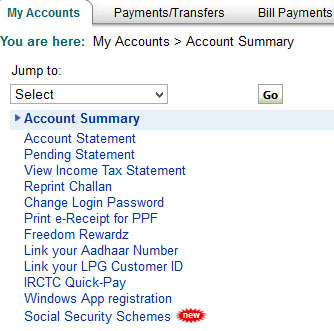 Any State Bank of India Account Holder who is having Internet Banking Activated can login into his or her account and register Online for Pradhan Mantri Suraksha Bima Yojana (PMSBY) and Pradhan Mantri Jeevan Jyoti Bima Yojana (PMJJBY) Social Security Schemes launched by Narendra Modi without going to branch to submit the forms of Pradhan Mantri Suraksha Bima Yojana (PMSBY) and Pradhan Mantri Jeevan Jyoti Bima Yojana (PMJJBY) Social Security Schemes. Below we have mentioned steps on How to Register Online for Pradhan Mantri Suraksha Bima Yojana (PMSBY) and Pradhan Mantri Jeevan Jyoti Bima Yojana (PMJJBY) in SBI. Login into your SBI Internet Banking by visiting Online SBI. Once you have logged in into your Internet Banking Account in Online SBI Portal, to register for Pradhan Mantri Suraksha Bima Yojana (PMSBY) and Pradhan Mantri Jeevan Jyoti Bima Yojana (PMJJBY) click Social Security Schemes under my Accounts tab. 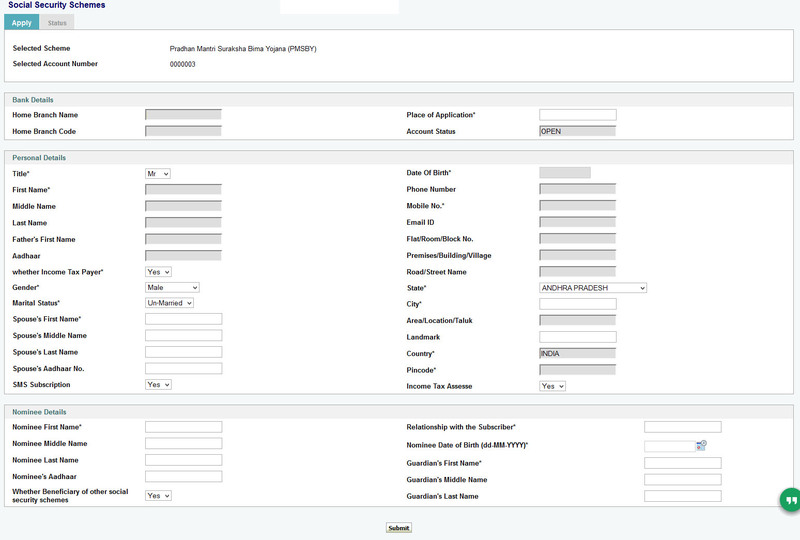 In the next screen select the Scheme from the list select your account number and click on submit button. In the next window a form will appear to apply for the scheme, just enter all the details which is asked in the form and click on submit button. And follow on the on screen process to register for Pradhan Mantri Suraksha Bima Yojana (PMSBY) and Pradhan Mantri Jeevan Jyoti Bima Yojana (PMJJBY). That’s it! It’s very simple now to get yourself enrolled or registered Online for Pradhan Mantri Suraksha Bima Yojana (PMSBY) and Pradhan Mantri Jeevan Jyoti Bima Yojana (PMJJBY) in State Bank of India. Online Registration through Internet Banking for Pradhan Mantri Suraksha Bima Yojana (PMSBY) and Pradhan Mantri Jeevan Jyoti Bima Yojana (PMJJBY) in Associate Banks of State Bank of India (SBI) like State Bank of Bikaner & Jaipur (SBBJ), State Bank of Hyderabad (SBH), State Bank of Mysore (SBM), State Bank of Patiala (SBP), and State Bank of Travancore (SBT) is same as mentioned above. Further next step for form….In the form if Marital Status is unmarried still asking for spouse’s First name..How to do? After selecting Marital Status as unmarried leave the spouse name details blank. can nri apply for these scheme? is there a option of changing the nominee later.? should the bank account be linked to adhar card before registering to these schemes? I don’t think NRI can apply for these schemes, and if available also do you think this much life and accidental insurance will cater a NRI’s needs. Dear Sir,what would be written in Place of Application & what is the meaning..plz clarify..
i have register for PMSBY on 28-05-15. status shown but nothing offered for downloading how i ensure that the said has been completed. are the send any document regarding PMSBY at my home adress ? Just check it under status tab, and if it’s not showing anything just contact Customer Care by dailing 1800 11 2211 & 1800 425 3800 (Toll-free from BSNL/MTNL landlines) or (080) 2659 9990 (other lines). when applying for jeevan jyoti vima yojna from SBI online, its showing transaction pending, view status. but the status have nothing. Yes it will take some time to register for the scheme, but once you are enrolled the status will update. can, i apply now or already expired. I have enrolled for the PMSBY but not received any policy documents. My SBI branch says that they are only mediators in the process. The SBI Life Insurance people say that they don’t take care of the PMSBY. Is there any way I can know with which insurance company I have enrolled for PMSBY. I have the CIF no and the reference no.